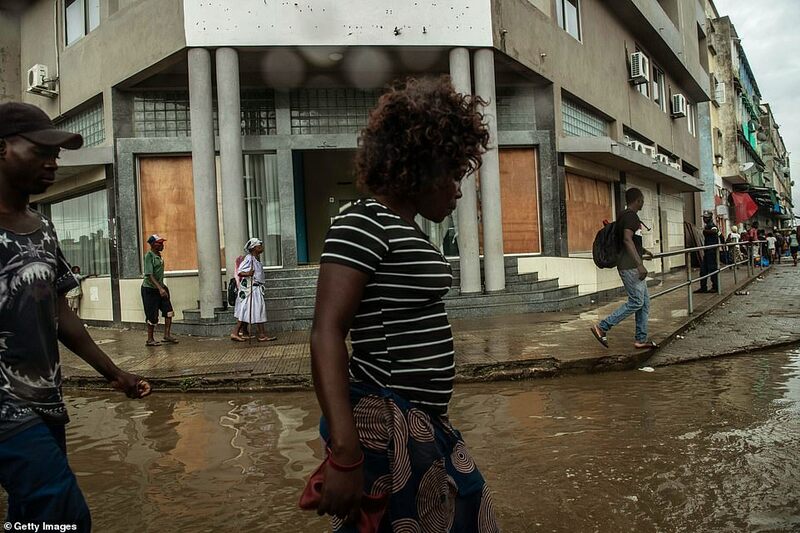 Rescue workers in Mozambique fear an outbreak of cholera, dysentery or malaria could take the death toll from Cyclone Idai even higher after the country’s President said as many as 1,000 people could have died. 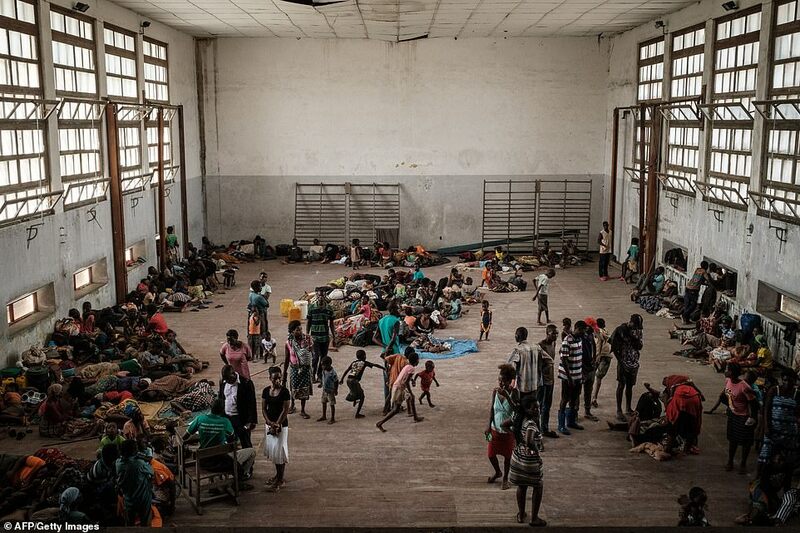 Up to 500,000 people are still believed to be at risk after the cyclone hit Mozambique’s port city of Beira on March 14 before moving inland. 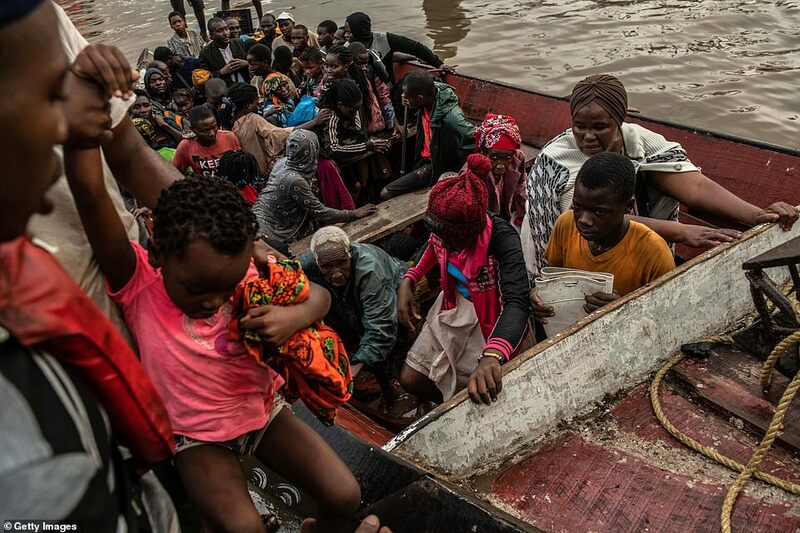 At least 360 people have died in Mozambique, Zimbabwe and Malawi, and 2.6 million people have been affected, the United Nations said, as Idai’s winds ripped apart homes, schools and medical centres. 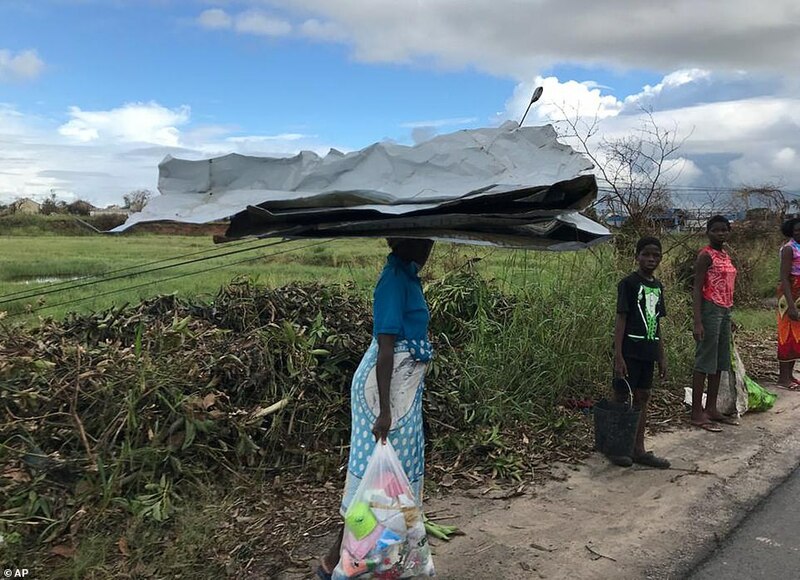 Accompanying heavy rains have triggered floods, inundating swathes of farmland, while health services and clinics have broken down and water supplies have been damaged. 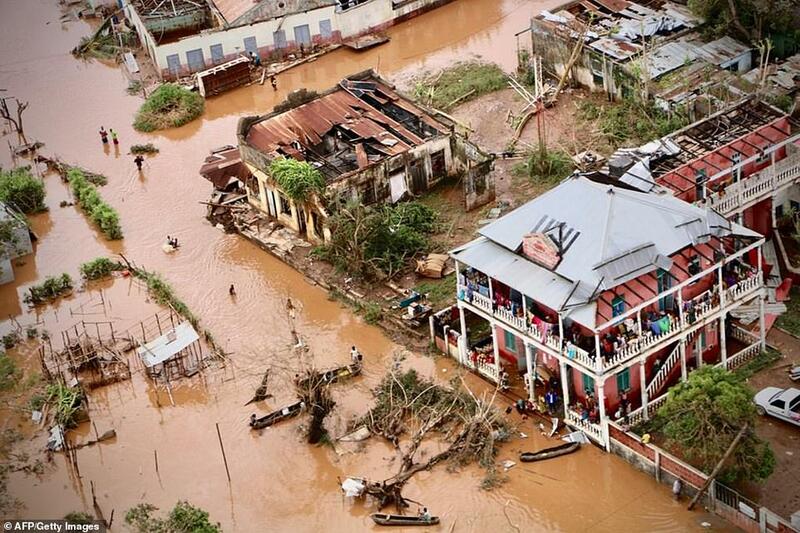 The British public donated £6 million to the aid appeal launched yesterday by the Disasters Emergency Committee (DEC), and the Government pledged to match the first £2 million – taking the first day total to £8 million. 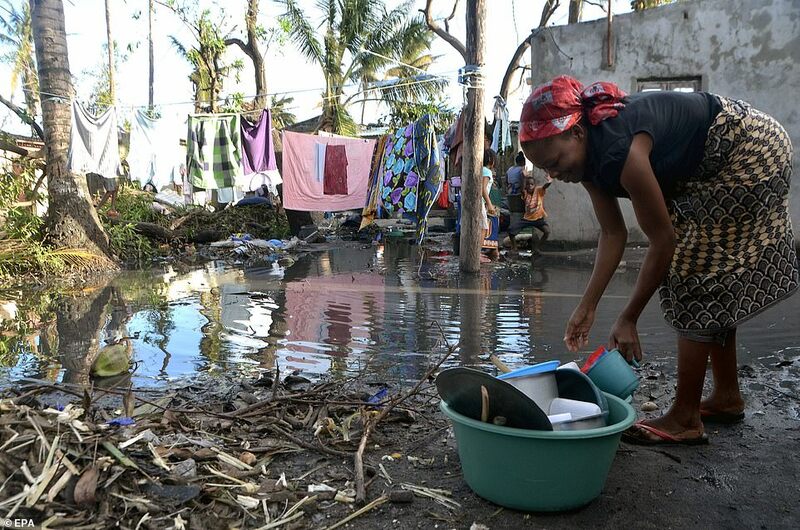 However, charities warned that far more money is urgently required if a humanitarian crisis is to be avoided, with alarming reports of only two or three days of clean water left in the devastated city of Beira. 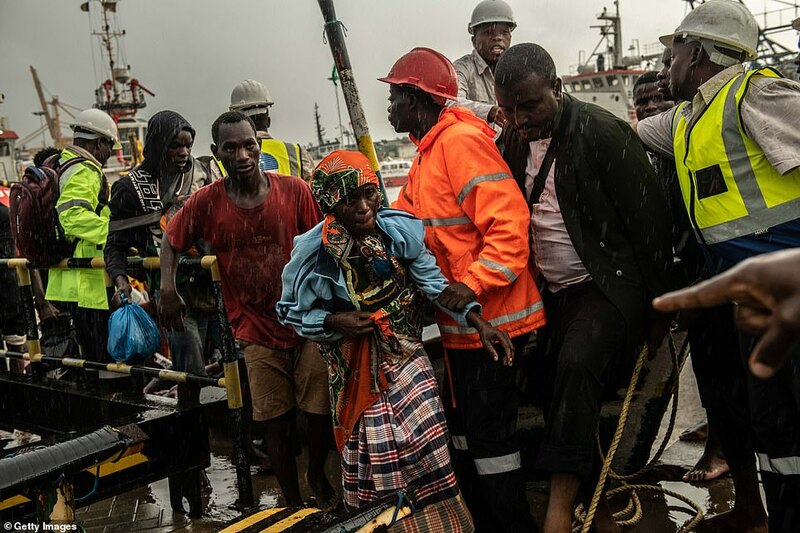 A team of ex-military volunteers, trained and experienced in disaster response, will today travel to Mozambique in the wake of the disaster. Team Rubicon UK’s advance team anticipate they will be working to get aid and water into the most remote, cut-off communities. Although supplies have begun to arrive, many communities remain inaccessible. The volunteers, predominantly military veterans, will focus on delivering where the need is most acute, with expertise in water purification, needs assessment, drones for damage assessment support and last-mile logistics. 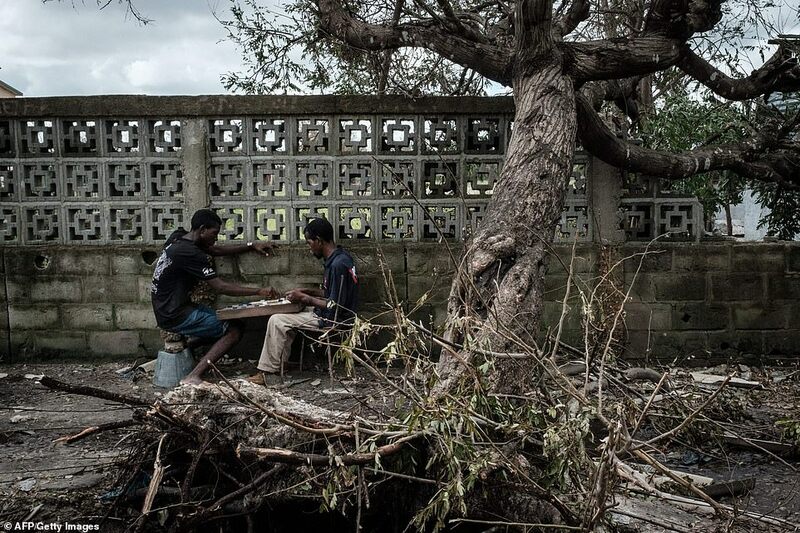 Medecins Sans Frontieres aid workers said people would resort to drinking water contaminated with waste and sewage as well as dead bodies which will be discovered as water levels recede. 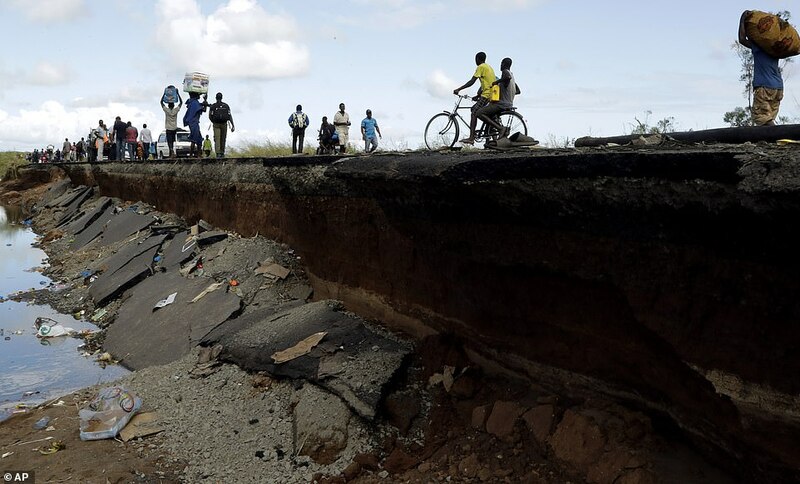 About 90 percent of the infrastructure in Beira city alone has been destroyed, said rescue workers, and rescue teams are battling to reach communities cut off due roads and bridges being washed away. In Zimbabwe’s eastern mountainous province of Manicaland, aid workers from the charity Mercy Corps said they had begun distributing purified drinking water packets, hygiene and sanitation supplies. Mildred Makore of Mercey Corps said populated areas such as Chimanimani town, were still cut off by road. With no power, hospitals had run out of fuel to operate back-up generators. ‘Both Chimanimani and Chipinge are malaria zones and with people sleeping outside, not having access to clean water sources and, once temperatures increase again, the potential for case numbers to rise is great,’ she said. 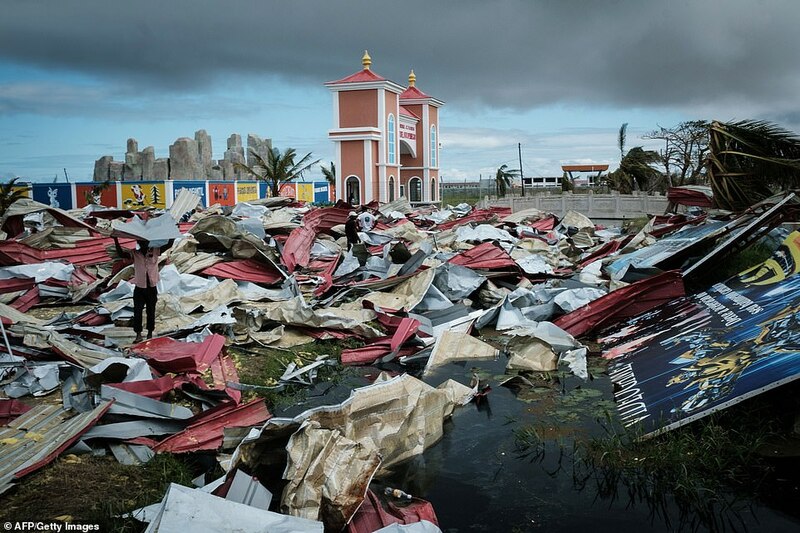 ‘This may be the most devastating such disaster in the region’s history, and its damage can escalate quickly if we do not act immediately,’ said Concern Worldwide’s U.S. chief executive Colleen Kelly. 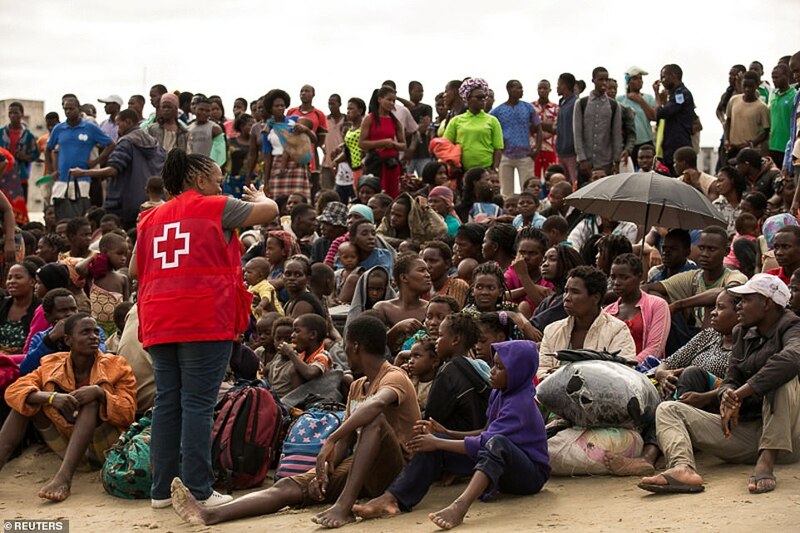 The situation in Beira ‘boiling’ as residents suffered shortages of food, water and other essentials one week after a devastating cyclone, the head of a South African rescue operation said on Friday. 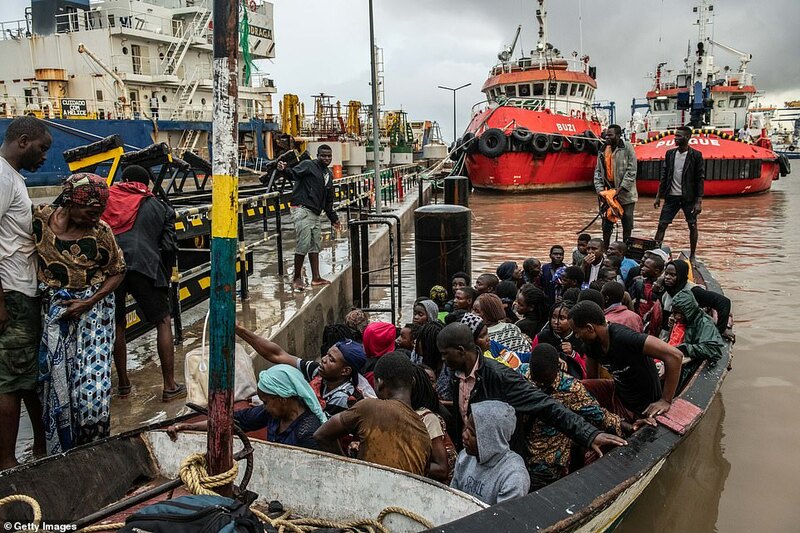 Connor Hartnady, rescue operations task force leader for Rescue South Africa, said residents of Beira – a low-lying port city of 500,000 people – were becoming fed up with shortages. 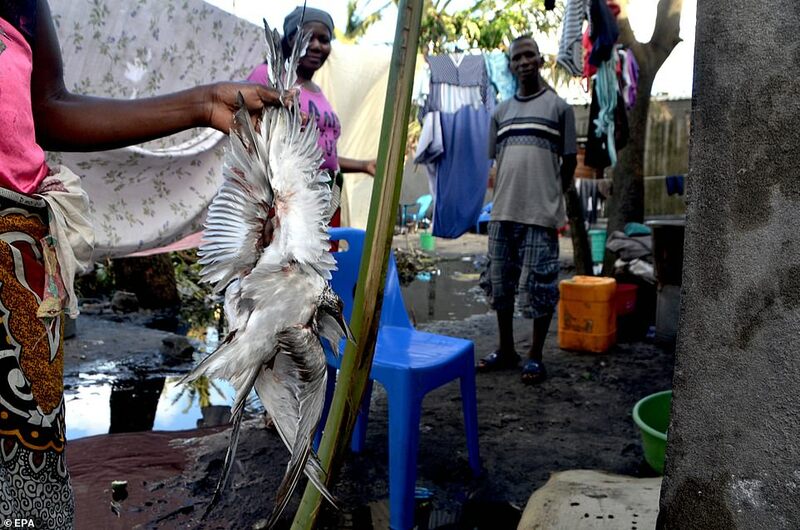 He also said a group of 60 people had been discovered trapped by flood water in an area north of Beira during a reconnaissance flight. 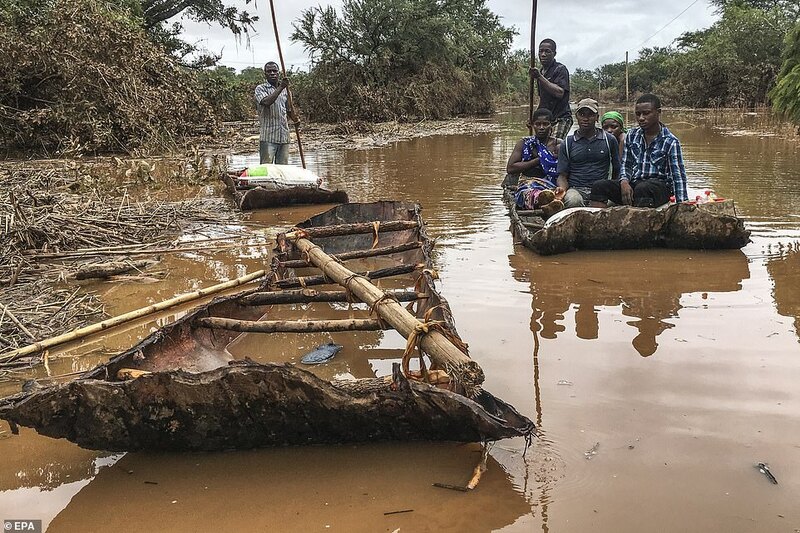 The storm’s torrential rains caused the Buzi and Pungwe rivers, whose mouths are in the Beira area, to burst their banks. 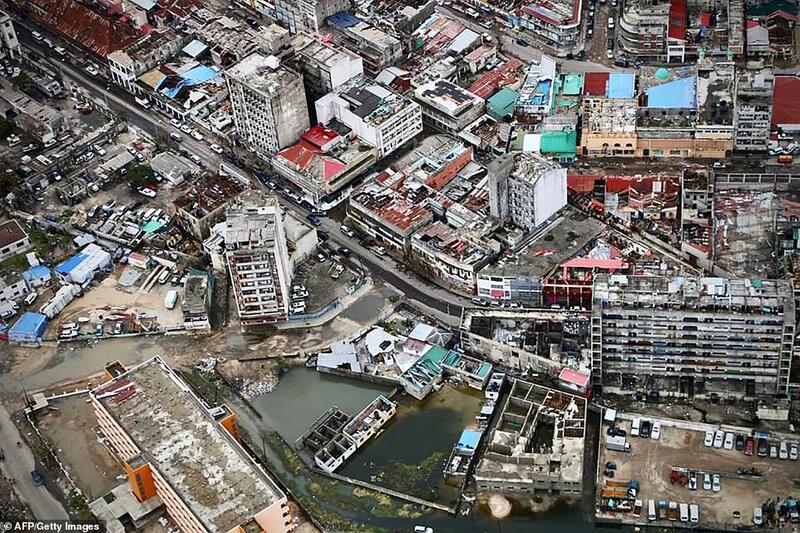 Roads into Beira were cut off by the storm, and most of the city remains without power. Donate to Team Rubicon here.